Stefan Wiechecki (pen-name Wiech; 10 August 1896 – 26 July 1979) was a Polish writer and journalist. He is most fondly remembered for his humorous feuilletons, which chronicled the everyday life of Warsaw and cultivated the Warsaw dialect. Stefan Wiechecki was born 10 August 1896. In inter-war Poland he collaborated with numerous Warsaw-based newspapers, initially as a court reporter. During numerous trials he documented typical personalities of the poorer, less-known part of the city with its distinctive culture, language and customs. With time he was given his own column in Express Wieczorny evening newspaper, where he published humorous sketches and feuilletons featuring personalities based on people taking part in trials he took part in. They gained much popularity and in late 1930s Wiechecki opened a chocolate shop in the borough of Praga, which became his main source of income. Praga is a district of Warsaw, Poland. It is located on the east bank of the river Vistula. First mentioned in 1432, until 1791 it formed a separate town with its own city charter. During the Warsaw Uprising, he was cut off from his house on the other side of the river, in the Old Town. There he collaborated with numerous newspapers published in the Polish-held part of town, notably the Powstaniec . Sharing the fate of the rest of Warsaw's civilians, Wiechecki was forced out of the city after the end of the uprising. However, he returned soon after the town was retaken from the Germans and resumed his duties as a journalist. Some of his humorous stories were published in book form, while others continued to be published by Warsaw-based newspapers. The Warsaw Uprising was a major World War II operation, in the summer of 1944, by the Polish underground resistance, led by the Home Army, to liberate Warsaw from German occupation. The uprising was timed to coincide with the retreat of the German forces from Poland ahead of the Soviet advance. While approaching the eastern suburbs of the city, the Red Army temporarily halted combat operations, enabling the Germans to regroup and defeat the Polish resistance and to raze the city in reprisal. The Uprising was fought for 63 days with little outside support. It was the single largest military effort taken by any European resistance movement during World War II. While criticised by linguists and polonists for filling the Polish language with trash, he was nevertheless considered a classic of the Warsaw dialect, at that time suppressed by schools along with all other non-standard variations of the literary language. One of the scientists to defend him in numerous articles was Bronisław Wieczorkiewicz, who later published the first monograph on the dialects of Warsaw. A renowned Polish poet Julian Tuwim dubbed Wiechecki the Homer of Warsaw's streets and Warsaw's language, his feuilletons are also mentioned in the works of Antoni Słonimski, Stefan Kisielewski and Maria Pawlikowska-Jasnorzewska. He died 26 July 1979 in Warsaw, where he is buried. After 1989 one of the main pedestrian-only zones of downtown Warsaw was officially named the Wiech Passage in honour of Wiechecki. The Warsaw dialect, or Masovian, is a regional dialect of the Polish language centered on Warsaw. The dialect evolved as late as the 18th century, under notable influence of several languages spoken in the city of Warsaw. After the destruction of Warsaw in the aftermath of the Warsaw Uprising of 1944 the Warsaw dialect has been in decline. It is estimated that in modern times it is almost extinct as the native language and is preserved mostly in literary works. Julian Tuwim, known also under the pseudonym "Oldlen" as a lyricist, was a Polish poet of Jewish descent, born in Łódź,. He was educated in Łódź and in Warsaw where he studied law and philosophy at Warsaw University. After Poland's return to independence in 1919, Tuwim co-founded the Skamander group of experimental poets with Antoni Słonimski and Jarosław Iwaszkiewicz. He was a major figure in Polish literature, admired also for his contribution to children's literature. He was a recipient of the prestigious Golden Laurel of the Polish Academy of Literature in 1935. Wiechecki's novel Cafe pod Minogą was filmed in 1956. This Warsaw-related article is a stub. You can help Wikipedia by expanding it. Henryk Adam Aleksander Pius Sienkiewicz was a Polish journalist, novelist and Nobel Prize laureate. He is best remembered for his historical novels, especially for his internationally known best-seller Quo Vadis (1896). Władysław Stanisław Reymont was a Polish novelist and the 1924 laureate of the Nobel Prize in Literature. His best-known work is the award-winning four-volume novel Chłopi. Eligiusz Niewiadomski was a Polish modernist painter and art critic who belonged to the right-wing National Democratic Party till 1904 and later continued supporting it. In 1922 he assassinated Poland's first President, Gabriel Narutowicz, in his first week in office as president. Bruno Jasieński pronounced [ˈbrunɔ jaˈɕeɲskʲi]; born Wiktor Zysman was a Polish poet and leader of the Polish futurist movement in the interwar period, executed in the Soviet Union during the Great Purge. Today one of the streets of Klimontów is named after him. Jasieński is one of the best known Polish futurists, acclaimed by members of the various modernist art groups as their patron. An annual literary festival "Brunonalia" held in Klimontów, Poland, is also named after him. Heinz Reinefarth, 26 December 1903 – 7 May 1979) was a German SS commander during World War II and government official in West Germany after the war. During the Warsaw Uprising of August 1944 his troops committed numerous atrocities. After the war Reinefarth became the mayor of the town of Westerland, on the isle of Sylt, and member of the Schleswig-Holstein Landtag. Polish demands for extradition were never honoured, nor was Dr. Reinefarth ever convicted of any war crime. Jan Nowak-Jeziorański was a Polish journalist, writer, politician, social worker and patriot. He served during the Second World War as one of the most notable resistance fighters of the Home Army. He is best remembered for his work as an emissary shuttling between the commanders of the Home Army and the Polish Government in Exile in London and other Allied governments which gained him the nickname "Courier from Warsaw", and for his participation in the Warsaw Uprising. After the war he worked as the head of the Polish section of Radio Free Europe, and later as a security advisor to the US presidents Ronald Reagan and Jimmy Carter. Stefan Kieniewicz was a Polish historian and university professor, notable for his works on 19th century history of Poland. During his work at various universities he became the tutor of several generations of Polish historians and his views on the last two centuries of Poland's history remain influential in modern scholarly works. Kazimierz Damazy Moczarski was a Polish writer and journalist, officer of the Polish Home Army. Kazimierz Moczarski is primarily known for his book Conversations with an Executioner, a series of interviews with a fellow inmate of the notorious UB secret police prison under Stalinism, the Nazi war criminal Jürgen Stroop, who was soon to be executed. Thrown in jail in 1945 and pardoned eleven years later during Polish October, Moczarski spent four years on death row (1952–56), and was tried three times as an enemy of the state while in prison. Warsaw is the capital of Poland. This page gives an overview of street names in the city that refer to famous persons, cities or historic events. Stefan Korboński was a Polish agrarian politician, lawyer, journalist and a notable member of the wartime authorities of the Polish Secret State. Among others, he was the last person to hold the post of Government Delegate for Poland. Arrested by the NKVD in 1945, he was released soon afterwards only to be forced into exile. He settled in the United States, where he remained active among the local Polish diaspora. An active journalist, he was among the few people whose names were completely banned by the communist censorship in Poland. Antoni Bohdziewicz was a Polish screenplay writer and director, best known for his 1956 adaptation of Zemsta by Aleksander Fredro. Saska Kępa is a neighbourhood in Warsaw, Poland, part of the Praga Południe district. 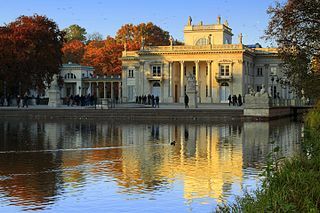 It is also the home to one of Warsaw's largest urban parks, the Park Skaryszewski. Głos was a Polish language social, literary and political weekly review published in Warsaw between 1886 and 1905. It was one of the leading journals of the Polish positivist movement. Many of the most renowned Polish writers published their novels in Głos, which also became a tribune of the naturalist literary movement of late 19th century. During the Revolution of 1905 it was closed down by tsarist authorities. Jan Walc was a Polish critic, literary historian, and journalist. He was the author of Feuilletons, reviews, reportage, and political and literary essays. A member of the democratic anti-communist opposition, the Workers Defense Committee (KOR), he was one of the organizers of the Independent Publishing House (NOWa), an underground publishing company and also operated the printing press. His works were published in Polityka, Kultura, Literatura na Świecie, Głos, Krytyka, Biuletyn Informacyjny, Kultura Niezależna, Puls, Zapis, Życie Warszawy, and Wokanda. He also wrote books on the works of Tadeusz Konwicki and Adam Mickiewicz. Artur Franciszek Oppman was a Polish poet of the Young Poland period, who wrote under the pen name "Or-Ot". Władysław Szlengel was a Jewish-Polish poet, lyricist, journalist, and stage actor. Antoni Stefan Koper was active in the Polish resistance movement during World War II and served as a lieutenant in the Polish Home Army. He helped rescue Jews from the Warsaw Ghetto and fought in the Warsaw Uprising. After escaping from a Nazi prison camp, he first fled to London, and then emigrated to the United States. There, he worked for the Defense Language Institute, United States Information Agency, and the Voice of America. He died of cancer in 1990.